If you are looking for a WiFi Captive Portal with a SMS-Gateway, advertising module, user authentication and database management – we’ve got a little something to interest you! 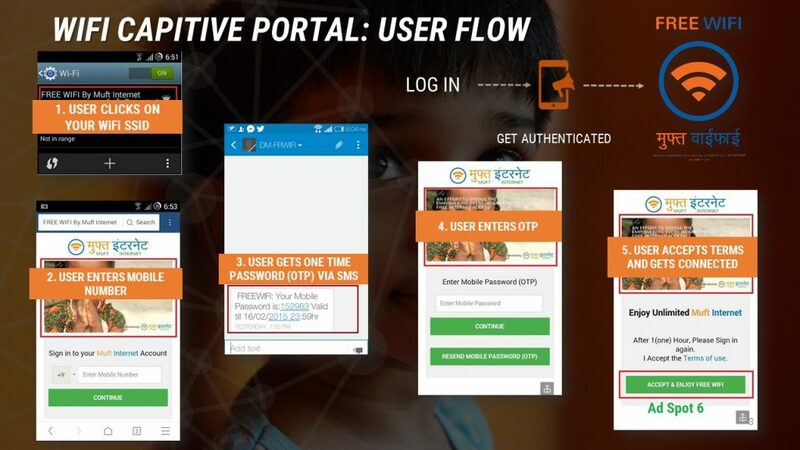 Every day, 100s of ISPs use Muft’s WiFi Captive Portal to authenticate users at public hotspots. Our online WiFi management software can help you create a network of legally compliant free WiFi Zones. Muft’s WiFi captive portal is used by cafes, gyms, waiting rooms, clinics, salons and so on to power their own advertisements and track users on their WiFi zones. Our WiFi captive portal is also used by ISPs, agents and ad agencies who want to create their own network of ad-sponsored free WiFi hotspots at different locations including but not restricted to hotels, bus stops, airports and marketplaces. Our WiFi Captive portal supports SMSes to mobile numbers from 180+ countries! The following tables and schema explain how our system works. Our WiFi management software automatically records end-user’s device MAC address and IP. A log of successfully authenticated users is maintained by our system. Since our WiFi management software is cloud controlled, you get access to an online software to manage your WiFi Zones. 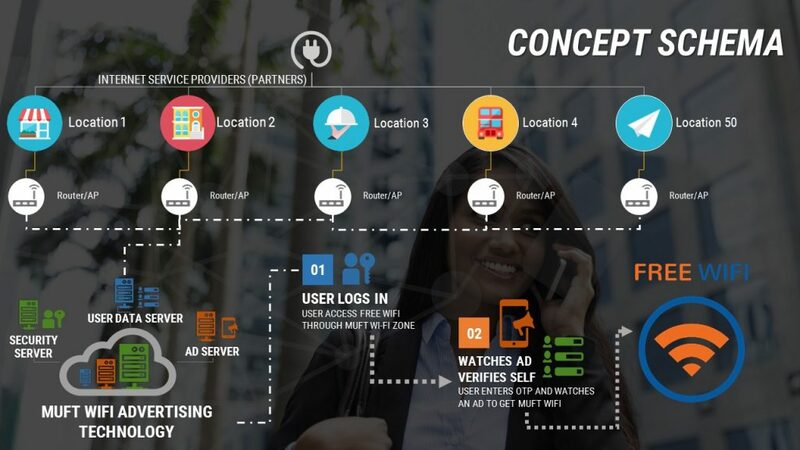 Access security logs, place WiFi advertisements and manage 100s of WiFi zones with one software. Attract more customers by posting offers through your WiFi login page to promote sales or sending SMSes to your customer database. 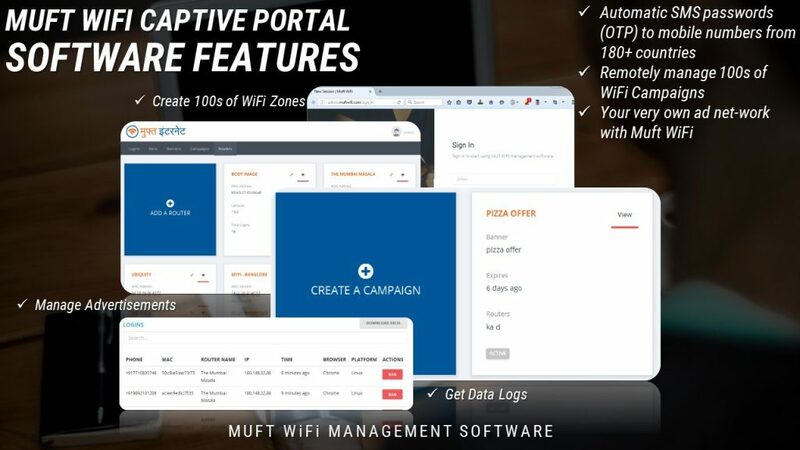 If you’re looking for a cost-efficient and robust WiFi captive portal with an SMS gateway, advertising module, automated user authentication and database management – the Muft’s WiFi Captive portal is one of the best choices. 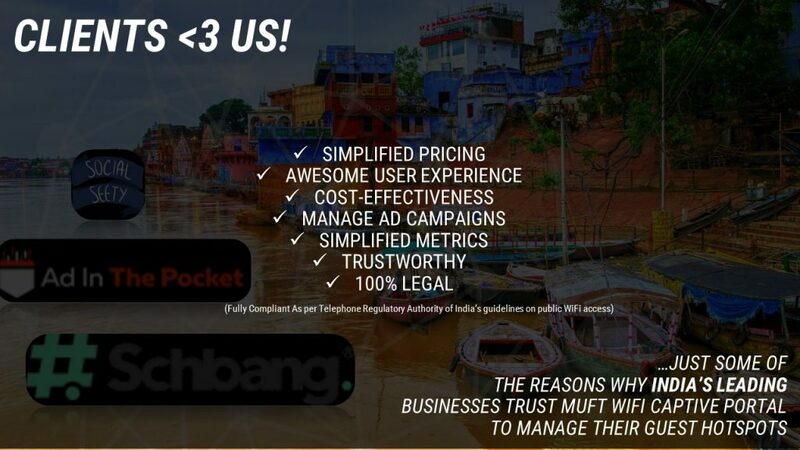 Contact our sales to team to get 6 months licensed use of this software free of cost.